On occasion, some of the best segments that make it into our shows were never part of the original outline. Perhaps I shouldn’t admit that, but this blog is about going behind the scenes, right? I’ve also learned that this can actually be a really good thing sometimes and that Team GGW is pretty darn good in a pinch. 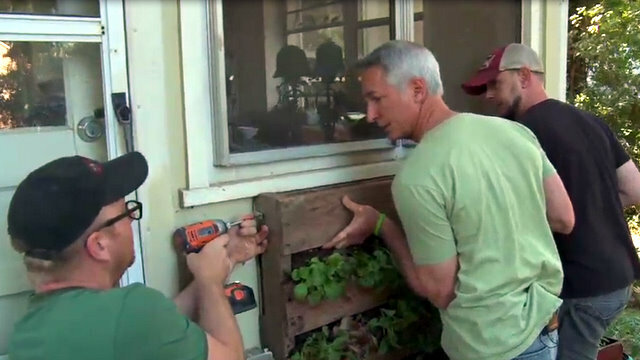 Such was the case for the DIY Pallet Garden scene for this episode. After two great days of filming the core subjects for this show in New England and a tight outline that we followed to the letter, we should have been finished with a complete show. But once in a while things don’t work out exactly as planned. When it was all said and done and a preliminary edit complete, we still had about a three-minute hole in this show. Even worse, the finished episode was due to APT in just over a week. So now what? This is where I tell myself not to panic. As calmly as I can (I’m getting better at this), I email our writer, Robin Haglund with an SOS with our dilemma. 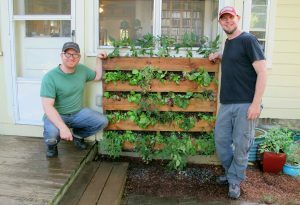 Although vertical gardens are really catching on, they’re not yet as common as the backyard vegetable garden. So now that we’re all back in our respective cities, where do we go now and what to show and talk about that relates to what we’ve already shot. It’s not like we can take this in a completely different direction. It has to tie into what we’ve already done, AND we need to be able to get there quickly. In other words, we need some fast thinking and a lot of luck to make this happen like tomorrow! Within a few hours, Robin emails back with a list of options, all of which have potential. But one seemed perfect. She had some friends that recently moved from Los Angeles to Asheville, NC and had a small house that they were looking to fix up. 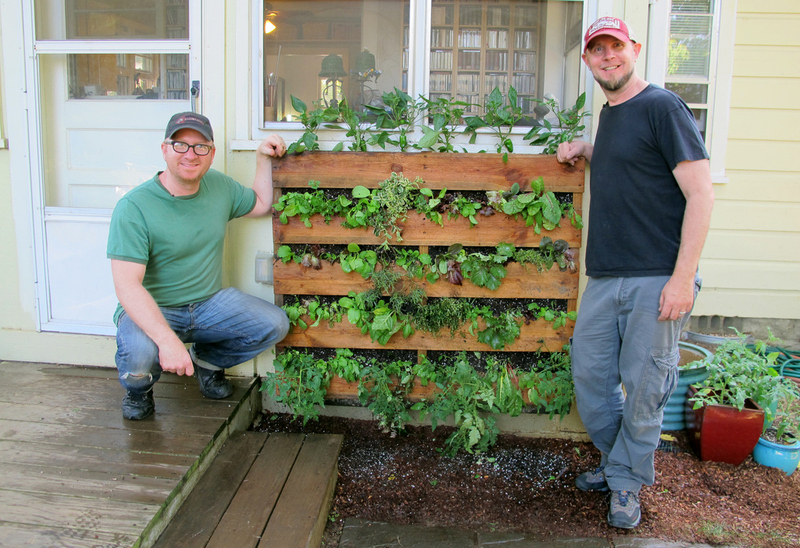 What if we built a small vertical garden on their patio wall using a pallet? The idea was brilliant! In doing some quick online research, Robin came across a post by our mutual friend Fern Richardson and her awesome blog, Life on the Balcony. In the post, she demonstrated how she created a pallet garden on her balcony. It was beautiful, simple, inexpensive and best of all, doable! Done deal. This was a no brainer. Asheville was only a two-hour drive away, Robin’s friends, Monty and Kai were totally game and this could happen quickly. Within a few days, we were on location and building our garden. Thankfully, this was one of those days that just worked. The light was good, sound wasn’t an issue (as it often is when you’re in a hurry), and the setting was perfect for the story. The guys were ideal as well since both came from a TV and film background (having lived in L.A.) so they totally knew the rigors of production on a deadline. 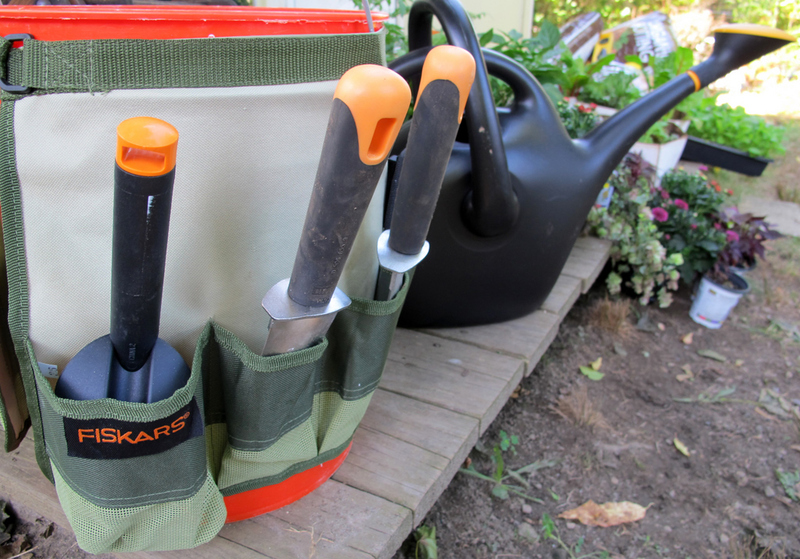 Tools for any garden, big or small! In real time, the entire garden took less than an hour to construct and mount. It was super easy to build, inexpensive, and totally fun to do, especially with some help. And in the end, it really looked great! So a special thanks to Robin for her brilliant recon, Fern for posting this fabulous idea on her blog and Monty and Kai for your willingness, accessibility and gracious hospitality in making this happen so quickly! And my take-away on this is yet another reminder that if you keep the faith, everything really does work out and life is good. If you want the complete step by step plans, here’s how we built this pallet garden. Watch the full episode this post is from, Episode 221: Living Walls. Here’s Fern’s post when she built her pallet garden and where we got our inspiration. Thanks Fern! Glad you liked it John. That was a really fun and easy project, especially when you have a friend or two to help. I’ve seen some really pretty ones since then. Niki Jabour has a new book coming out this spring and it includes a section I wrote on the pallet garden. The artist for the book did a great job making it look fantastic. She even painted the pallet in a pastel color and it looks fantastic all painted with everything growing. Food for thought. Thanks for the note John. What about chemicals, bacteria, etc. in the pallet wood being one would not know where they have been? I couldn’t believe my eyes one EARLY morning waking up with a cup of coffee watching TV!!!! HERE WAS THE ANSWER TO MY DILEMA!!!!! I bought this bank repossessed house, maybe call it a possessed house? SO VERY MANY THINGS TO DO to make it livable again! I live alone, a very young 63 years old, on a limited income, a total outdoors person, lives with 12 horses, 2 dogs and 2 worthless barn cats, and the pallat vertical garden is going to solve some of my problems. I built flower beds all around the once-awesome decking around the back of my house. From the deck to the ground there used to be wood lattice that the former occupants dogs destroyed. Have you looked at the price of vinyl lattice these days? Around $25 each 8 ft section. And I would need around 20 sections and just couldn’t afford it. Also since I can’t afford a garden rotor tiller I’ve been planting vegetables in and around my flower garden surrounding the deck. I had beans, morning glories and pickles climbing up strings attached to the bottom deck boards with nails. Looked REAL pretty and I had lots of veggies to can, freeze and eat besides. But the rest of the blank area looked awful! So this spring I’m going to gather pallats and place them where the lattuce would go. WALLAH!!! It’ll look cool and give me more garden area. Also the former owners ripped out an underground pool adjacent to the house so I filled it in with sand and have been dumping my horse manure on the area. In the spring I’m going to rent a tiller and make that area into more garden. The deck encompasses half of the old pool area so I’ll have steps built from the deck into my garden. I’m planning on reading more of your articles and videos on how to make this successful. 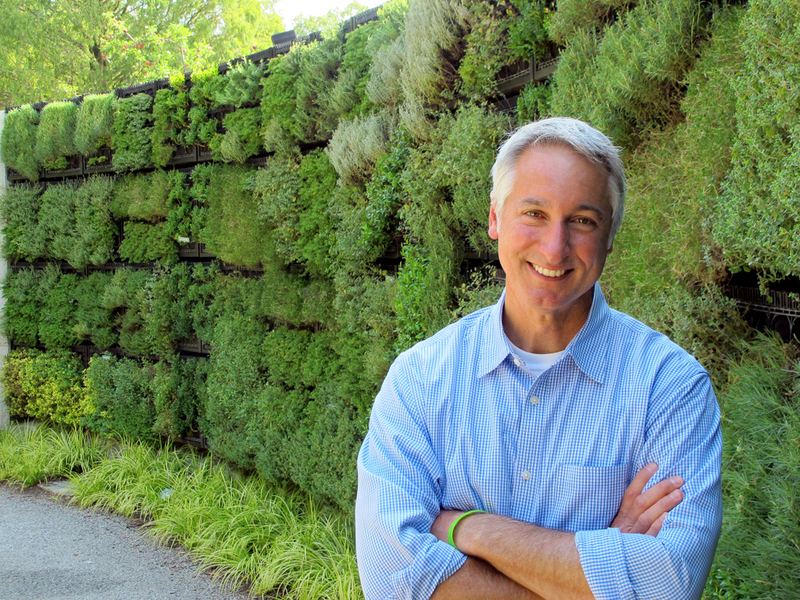 Wow, wouldn’t it be cool if the Growing A Greener World team could showcase a help for my home? What an honor that’d be. Best wishes to all. When life gives ya lemons? Make lemonade!!!!! And Never Give Up!! !